We want Explore the Salish Sea: A Nature Guide for Kids to be available to every 5th and 6th grader in the Salish Sea regardless of ability to pay. If you would like to support that mission, you can mention our “children’s book scholarship” in the notes section while making a donation to SeaDoc. Just click the button below. A $100 donation gives five books for five kids. A $500 donation gives books to a whole classroom. Thank you! Give Books to Kids at a Discount! The SeaDoc Society has published a book for the next generation. 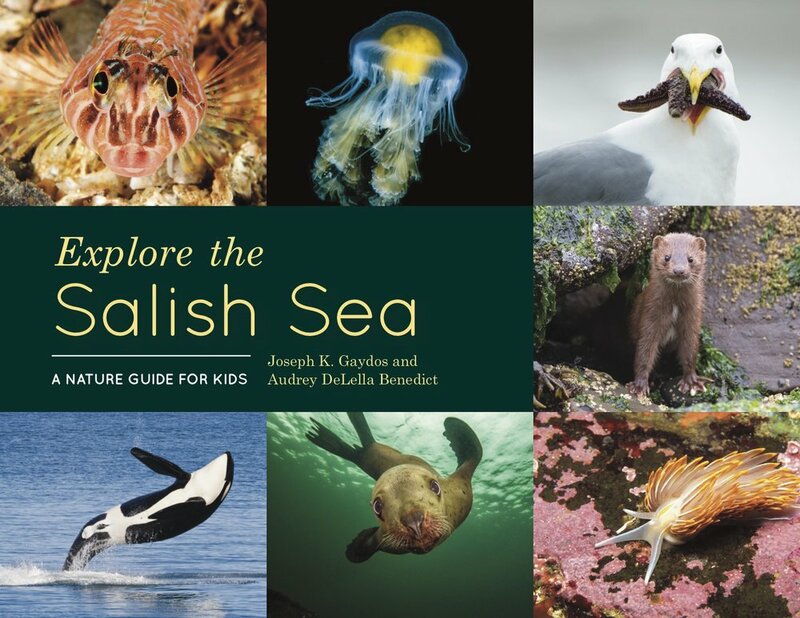 Filled with beautiful photography and engaging stories, Explore the Salish Sea: A Nature Guide for Kids inspires children to explore the unique marine ecosystem that encompasses the coastal waters from Seattle’s Puget Sound up to the Strait of Juan de Fuca and the Georgia Strait of British Columbia. The book hit #1 in the Pacific Northwest Booksellers Association's Early and Middle Grade category and #1 on Amazon's Children's Environmental and Ecology. “The book encourages kids to get out and explore, and to think about ways to help take care of the Salish Sea every day. More than gee-whiz facts, the book is aligned with Washington state core science-learning standards to step kids through the fundamentals of the ecology of the Salish Sea. “Explore The Salish Sea is a nature guide for kids. It’s about the unique marine ecosystem that connects Puget Sound with Canada. It’s aimed at fifth and sixth graders and based on a previous edition made for adults. “A cross between a picture book and a chapter book, this captivating guide packed with colorful photos will keep readers occupied in the car for hours on a road trip and ensure they’re ready to explore upon arrival. “If there is an award for the most beautiful book of the year, a new natural history of the Salish Sea must surely be in the running. “While it was primarily designed for fifth graders, [the book] teaches us all that we can — and must — make a difference for the health of the Salish Sea and the living things that depend on it. AUDREY DELELLA BENEDICT is a biologist, writer, and passionate advocate for the conservation of the global ocean and Arctic and alpine environments the world over. She is founder and director of Cloud Ridge Naturalists, a nonprofit natural history educational organization now in its fourth decade. She is currently a member of the board of the SeaDoc Society and served for nearly a decade as a trustee for the Colorado chapter of The Nature Conservancy, from which she received the prestigious One Conservancy Award in 2003 for her work in Ecuador. Audrey splits her time between her home at 9,000 feet along the Colorado Front Range and her off-grid cottage on San Juan’s Frost Island.